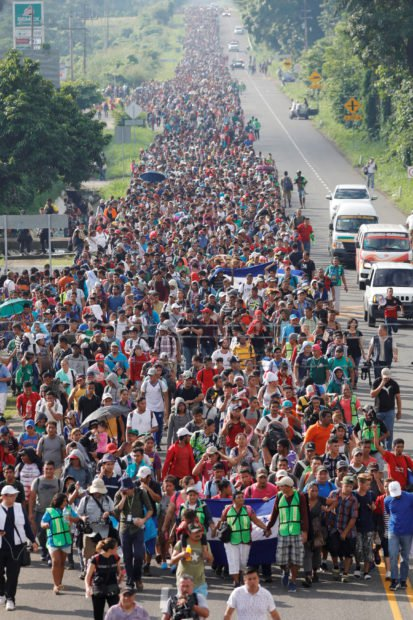 Since President Trump threatened to close the Southern border due to Honduras' unwillingness to comply with his requests for assistance in stopping a migrant caravan marching toward the US, the migrants have successfully crossed into Mexico and on Sunday regrouped after being temporarily delayed at the Mexican border by border guards who failed to force the migrants to turn back. So, for the second time this year, it appears President Trump is ready to send more US troops to the border, as he said in a tweet Monday morning that he'd notified the border patrol and military that this is a "national emergency" while reiterating that the blame lay with Democrats for refusing to change our "pathetic" immigration laws. The president also claimed that "unkown Middle Easterners" had become "mixed in" with the caravan. And since Honduras and Guatemala did nothing to stop the migrants despite Trump's requests for assistance, the president added that we would be cutting off aid: "We will now begin cutting off, or substantially reducing, the massive foreign aid routinely given to them." The backlash to the migrants has intensified over the weekend, as the mile-long caravan has continued unimpeded toward the US's southern border. Amusingly, liberals bullied the Associated Press on Sunday into correcting one of its headlines after the wire service described the caravan as an "army of migrants". "A ragged, growing army of migrants resumes march toward US,” read the original headline on the AP story. The AP later changed the headline to replace the word "army" with "caravan." Though the AP has used the word "army" to refer to large groups of people besides migrants - including nurses and political activists - many on the political left criticized the wire service for its original headline. Meanwhile, videos have emerged of people handing out cash to the migrants, raising suspicions that the caravan has received outside funding for its assault on the southern border.